When hunger strikes in Amelia Island’s Historic District, look no further than Ciao Italian Bistro. Luca and Kim Misciasci, owners and operators of Ciao Italian Bistro, have created a warm, inviting atmosphere that is perfect for a night with the family or a romantic evening with that special someone. There are plenty of places to sit inside in Ciao’s dimly lit, yet vibrant dining room and bar area. It is also lovely to people watch in the Historic District from Ciao’s roomy outdoor seating–rain or shine! Complimentary bread comes to your table fresh, warm and crusty with a side of pesto and olive oil for dipping–a perfect way to jumpstart your appetite. Speaking of appetite, the appetizers at Ciao are not to be ignored. Consider starting off your meal with an order of the Bruschetta: crunchy grilled bread slices topped with fresh tomato, red onion, basil and capers. The burst of fresh flavors paired with the rustic textures of the bread makes for an addicting combination. Since this is an Italian bistro, pasta reigns supreme. The Rigatoni Bolognese features rigatoni served al dente with a delicious meat ragù sauce with mushrooms and seasoned beautifully. We know what you’re thinking–“I don’t want to order the pizza at a nice restaurant.” Well, think again, because the signature pizzas at Ciao Italian Bistro are a favorite among locals. The pizza crusts are “paper thin” and baked in a piping hot oven until crispy. The Pepperoni con Olive features a light layer of rustic tomato sauce, fresh mozzarella, pepperoni and olives–simple, yet packed with flavor. Darren, our server, talked about how Ciao is more than just a workplace for him. Come in and let the Ciao Italian Bistro team treat you like family. 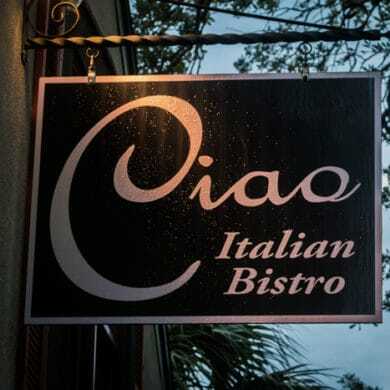 Ciao Italian Bistro is located at 302 Centre St, Fernandina Beach, FL 32034. For more information, visit the Ciao Italian Bistro’s website or call (904) 206-4311.